Next time you bump into “them” at Walmart, don’t be so surprised, they’re there to serve a purpose. The self-driving, Zamboni-style robots making their way into the aisles at the supermarket happen to be the store’s newly-appointed janitors. 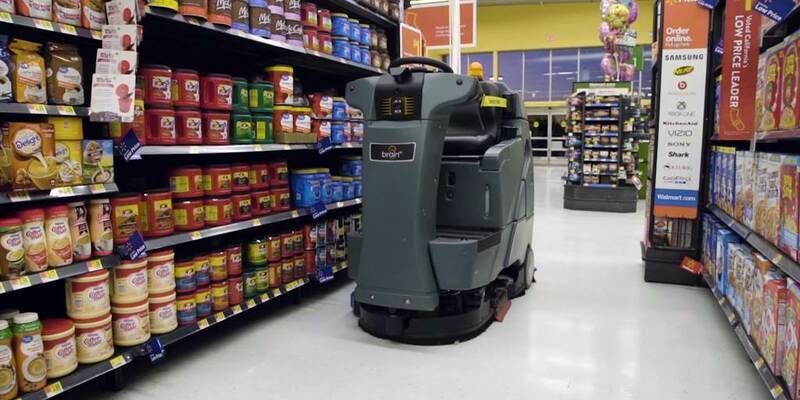 The retail giant has announced that they will be adding 360 autonomous, floor-scrubbing robots to its stores nationwide. The target date for the robot-janitors to be operational is in January next year. Helping Walmart is Brain Corp., makers of Brain OS, the artificially intelligent platform that runs the machines. As it is, there are already 100 machines at work. The robot janitors in action have yellow safety guards on both sides, preventing any customers from recklessly hopping on and taking a ride while the machines are busy cleaning areas in the store. There’s also a siren on top with a subtle “beep, beep sound” so shoppers can be aware that a robot-janitor is coming through to fulfill its task of cleaning. The robots, however, are not just limited to janitorial services, it seems. They can also act as “spy” of sorts, because they have sensors that allow them to collect information, which can then be uploaded into the retailer giant’s cloud-based platform. An example of the data the robots are capable of gathering include getting data on which shelves are empty while they clean. This isn’t the first time that Walmart is experimenting with automation. A shelf-scanning robot is already being tested in 50 locations. The shelf-scanning robot is capable of alerting a team when some items are out of stock or are priced incorrectly. There’s also Alphabot which quickly retrieves items in storage to aid in filling online orders. Brain Corp says the robot janitors are such efficient floor scrubbers, doing better cleaning consistency and coverage. They insist that this is actually good for everyone since staff can now focus on “higher value” assignments. The challenge is that as more and more robots are being employed, and more companies going the route of automation, a McKinsey report says that around 400 million to 800 million human jobs worldwide could be displaced by 2030. Had those at the airport, didn't last long either. Too many public incursions. Look for a slew of lawsuits claiming the robots injured a shopper. At the Walmart close to me these would be an important compaird to most of rhe rude migrants they've hired.